Gatherings are always better when LOVE is present. On Thanksgiving or other holiday meals, the Love Shaker can be passed around the table as a way for each person to share gratitude and blessings as they shake LOVE on the festive food. Mother’s Day is even more special when Mom is showered with your Love Shakers LOVE. Anniversary festivities can be enhanced with Love Shaking remembering favorite times shared together. The Love Shaker is the perfect addition to a family reunion to bring more connection and interaction between the generations. No matter what your age, everyone in the family can shake and share LOVE. LOVE is what makes a house a home. 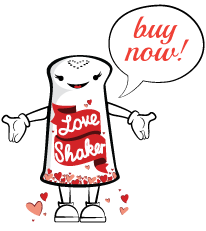 The Love Shaker is a great way to bless a new home. Have your kid’s participate in gardening by shaking LOVE on the plants and helping them grow. Graduations are a perfect time for shaking LOVE on the graduate and extending joyous congrats! Retreats and vacation getaways are even more restorative with the added ingredient of LOVE. Road trips can be filled with LOVE and laughter by shaking love on each other inside the car, or on other drivers and passengers. Furry friends tails wag more excitedly with a bit of Love Shaker LOVE added to their food too! Even Halloween can be less spooky with Love Shaking on trick or treaters into the night. At any gathering the Love Shaker can make everyones experience filled with more LOVE, laughter and joy!